Drinking will help us plan! Last time I posted about the couch updating, I talked about reinforcing the sofa frame to deal with a crack. After that job, I started working on the pattern for the slip cover. The cushions are going to be relatively easy (ha!) 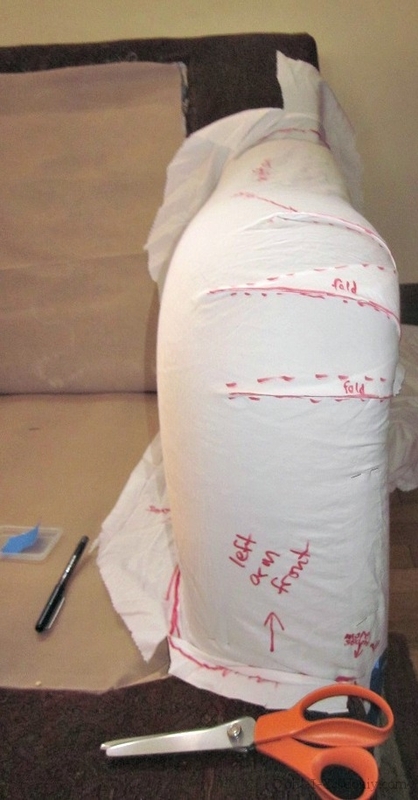 because I can rip the seams on the existing ones and use those as patterns, but the body is a different matter. 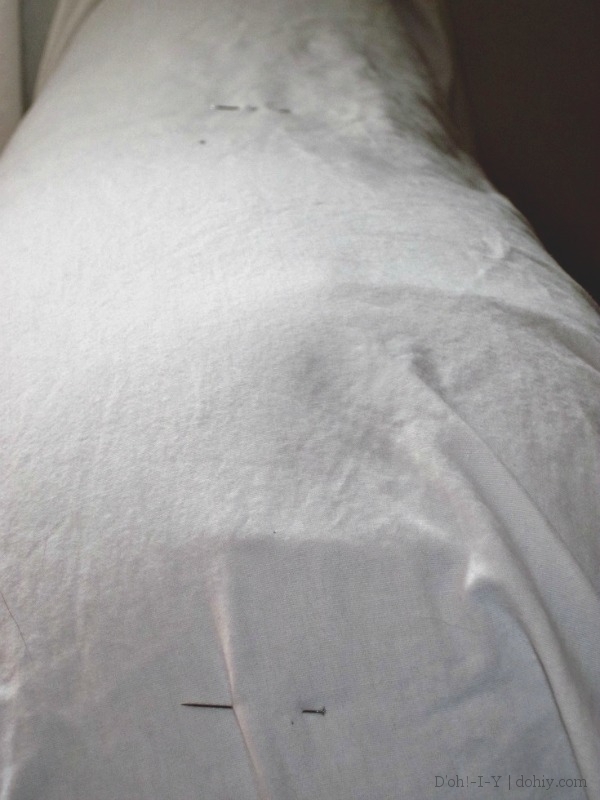 I took an old sheet and started draping it over one arm and pinning it directly to the sofa as it started to take shape. This would definitely make a professional pattern-maker cry (and even most amateurs! ), but I am not great at visualizing things in three dimensions. Being able to fiddle with the fabric until each piece made sense was a good way for me to work it out. When one area worked, I would pin it down and cut it away from the larger sheet to make a pattern piece. 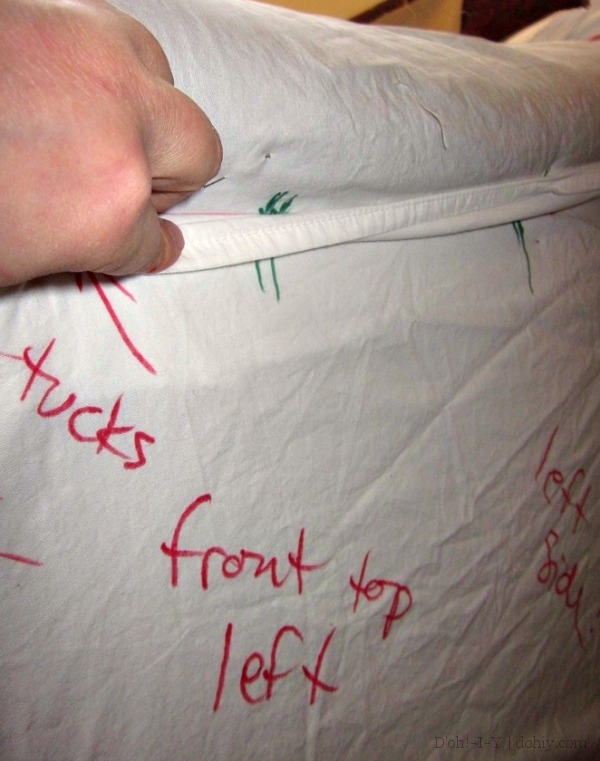 Many slipcover tutorials recommend making a pattern by pinning the pieces inside out, but this sofa has some asymmetrical tucks on the arms that make the inside-out technique a little tricky, if not outright impossible (for me). Tucks marked up on the pattern piece. Instead, I used drew the connecting lines right on the sheet with permanent markers. I could make sure these seam lines would match up because I could see through the thin sheet material. I also made marks in different colors for spots that would match up when sewing to keep everything on track. These registration marks will be cut out as diamond shapes on the real slipcover fabric (just like on a real pattern!). I also wrote all over the pattern pieces to help me keep track. 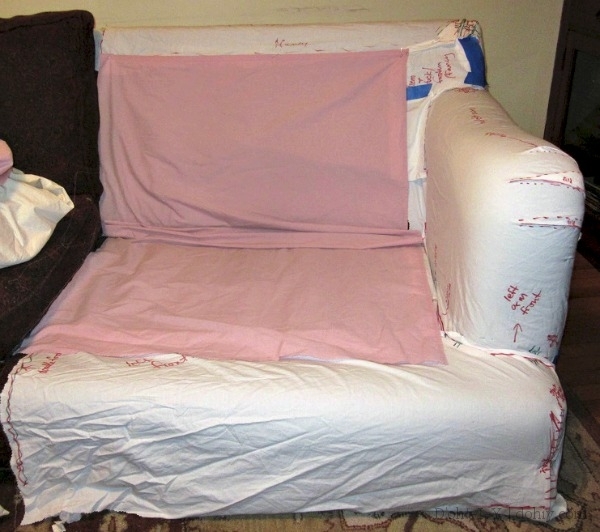 Where there’s pink sheeting, there will be less expensive fabric just to hold stuff together under the cushions. Not that I’m going to buy anything particularly expensive for any part of this effort — I’m still not convinced I’ll be able to make this work! So I’ll save the fancy fabric for the next slipcover (or for just reupholstering the thing — my staple-gun-level reupholstery would be far less work than this slipcover lark). The cushion itself is only covered up to where it’s sewn to the body, leaving a big open hole in the back, and the body was just barely covered by the beige stuff, which was sewn into the same seam. You know, we spent more than we could afford at the time on this sofa, and cheesy stuff like this is retroactively disappointing! Despite the fact that this mess will be covered by the slipcover and then the cushions, I didn’t like this all hanging out, especially since the back cushions won’t be attached in future. I whip-stitched the beige thing back into place, but I still thought the back cushions could use a bit more protection from those springs. 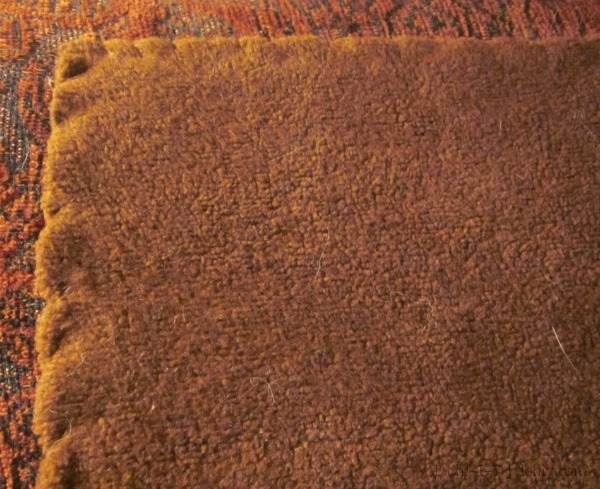 I picked up a remnant of a thick knit, doubled it up, and then used a curved upholstery needle to stitch it right to the existing upholstery. This covers the entire inside of the back, but will be behind the cushions and under the slipcover. It should add a little protection and help support the cushions better when they are loose. I’ve received all the fabric samples I ordered online during the POLAR VORTEX!! and they are now draped around the place. It looks like Barbie decided to have a blanket drive in here! There are some very cool options, but I’m inclined to go with a deep brown canvas and then dress it up with pillows. It’s affordably priced (important since this is a bit of an experiment), and it seems like it would be cat-resistant. I’m really drawn to an orange fuzzy fabric, but the other sofa is green and I’m just imagining the room ending up looking like a statement on Irish unity. Neutral canvas slipcovers are at least a less overtly political option! 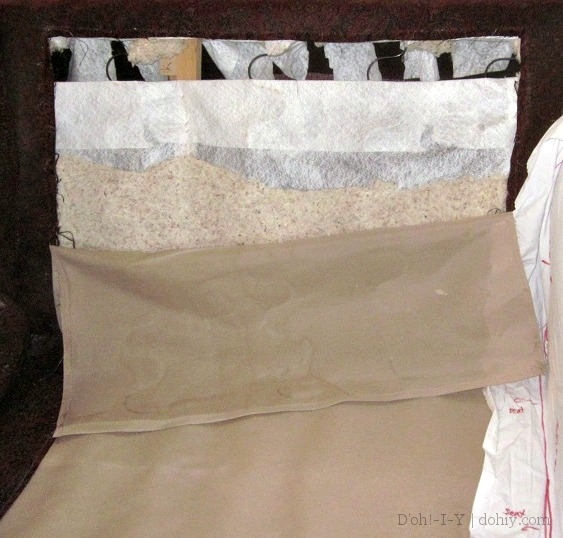 This entry was posted in Decor, Furniture, Repair & Maintenance and tagged fixing the back of a couch, making a slipcover pattern, preparing a sofa for reupholstery, preparing a sofa for slipcovering, reupholstering a couch. Bookmark the permalink.